Last month, DC Universe unleashed the long-awaited third season of Young Justice. 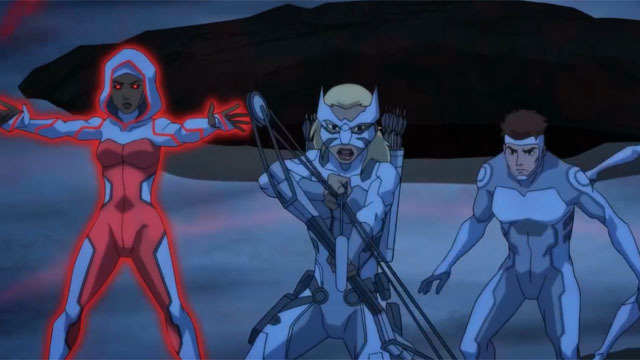 Although Young Justice: Outsiders largely follows a new team of recruits, most of the original team still plays a role in the story. Technically, Nightwing has been out of the team since Young Justice: Invasion, but he’s shepherding the next generation of heroes alongside Black Lightning, Tigress and Superboy, with an occasional assist from Miss Martian. Earlier this week, DC Daily dropped the first teaser trailer for the second half of Young Justice: Outsiders. In the clips, Nightwing offers Geo-Force, Forager, Cyborg, Tara, and Halo the chance to make their own choices. Apparently, they decided to remain in the team, as the closing seconds bring the Outsiders face-to-face with Black Manta and his forces. It also appears that Black Manta is holding a grudge against Tigress for her part in Kaldur’ahm’s undercover operation. Speaking of the former Aqualad, Kaldur comes face-to-face with Amanda Waller, as she threatens to expose the League’s secrets. Additionally, Beast Boy demands a slot on the team, and four superpowered teens are sent on a one-way trip to Apokolips. It’s only a fleeting glimpse of what’s to come. But a showdown with Darkseid is inevitable. There are two lingering questions: can the rookie heroes survive the scourge of the New Gods? And will they be destroyed by a traitor within? Young Justice: Outsiders will return this summer with 13 new episodes. You can watch the new teaser trailer below. Then leave a comment for us below!